It’s not every day that we get to witness two remarkably adept scholars in mutual admiration of each other’s works, drawing on each other’s extensive knowledge in a lively discussion on discovering the Bhagavad Gita. So on Day 1 of the Bangalore Literature Festival, we were in for a treat. Author of nine poetry books and of the Bhagavad Gita as a poem, Mani Rao opened the discussion with a broad question directed toward Devdutt Pattanaik, wherein she said “What you’ve done is taken a text that can be seen as authoritative, canonical and recast it as a retelling.” She expressed her curiosity in finding out how the author had done so. 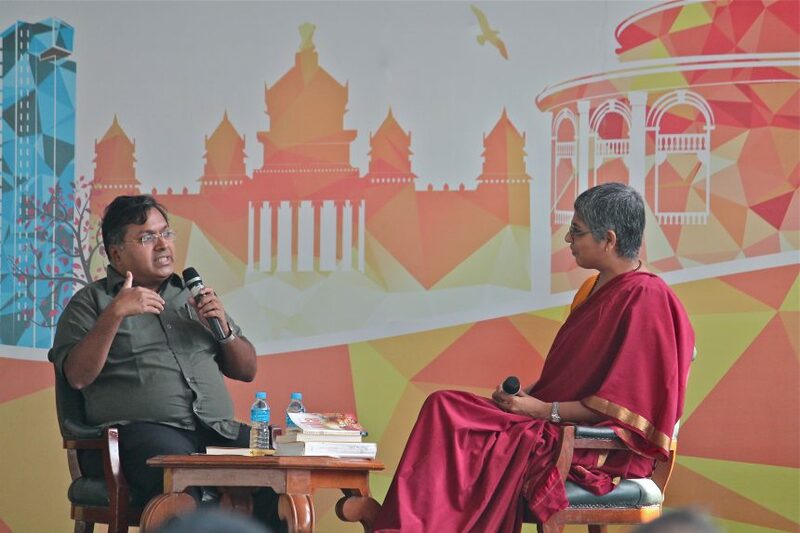 In his response to Rao, Devdutt Pattanaik explained his tendency to examine the story from a mythological perspective, and spoke of the phenomenon of High Culture and Low Culture, and how mythology was separated from philosophy. Drawing a parallel with the Greeks – the poet Homer and the philosopher Socrates – Pattanaik mused that they were on different levels. As the author of My Gita, acclaimed mythologist Pattanaik demystifies The Bhagavad Gita for the contemporary reader. Sharing her experience with the Bhagavad Gita, Rao said, “When I read the Gita for the very first time, I was completely shocked. It was a poetic experience for me.” She observed that the language has a simplicity but at the same time there is a lot of wordplay, assonance and drama. Through the centuries, it has become a monotonous text, read in a very standard way. Rao then directed the conversation to the topic of egalitarianism, where she made the observation that Pattanaik had differentiated between varna and jati. “I am a beneficiary of the caste system, I don’t deny the horrible nature of it,” said Pattanaik. But something that has established itself for thousands of years won’t just go away in 50 years’ time, it will indeed take time, and the first step is for us to acknowledge it. Continuing the line of thought, Pattanaik, a renowned author, mythologist, and leadership consultant explained that a man’s desire to dominate shows his powerlessness, “and that is not wisdom.” He likened it to creating the Periodic Table and placing gold above copper in value. According to him, scientists will not do that, businessmen would. Rao then spoke about how interesting it was to her that Pattanaik had brought in the Ramayana in his Gita. She mentioned how he had taken all the abstractions we see in the Gita and given contextual and psychological sides to them in detailed examples that made it easier for people to read them. Closing the discussion on an incredibly positive note, Pattanaik looked to the audience and said that they had heard his Gita and Rao’s Gita, and hopefully they will soon have their own Gita as well.